I can't get enough of the blue! Can you? I have been munching on this superfood for weeks now, and loving it! Blueberries have a great amount of fiber, vitamin C and a perfect source for manganese (your body requires this to function), and this superfood is great for weight-loss because it is low in calories. Paired with green lettuce, this salad just gets better! Greens are essential for lowering cholesterol levels. Eat more lettuce so that your body will be stocked with lots of antioxidant agents. Antioxidants are good for protecting the body from free radicals which attack healthy tissues within the body. On top of that goes feta cheese. Feta, for short, is full of cancer-protecting effects and protects bone health. So why not make a salad with blueberries and drizzle some homemade balsamic dressing for your next healthy meal! Arrange 1/2 cup raw walnuts on a baking sheet. Toast for 5 minutes. Chop 3 cups green lettuce. 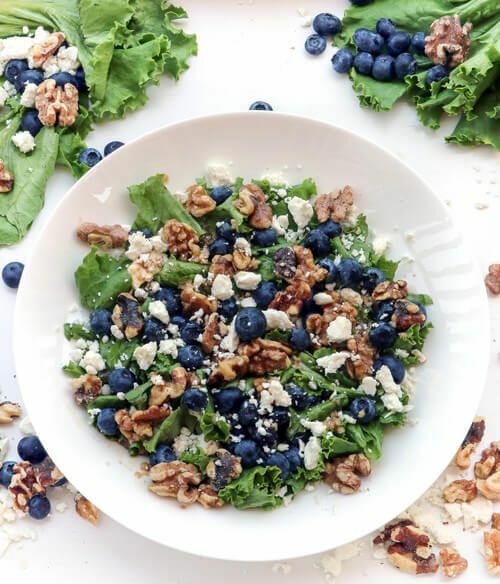 Mix with 1 cup of blueberries, toasted walnuts, and 3 oz crumbled feta cheese. Balsamic Dressing: Whisk together 1 Tablespoon balsamic vinegar, 1 Tablespoon red wine vinegar, 1 garlic clove, 1 teaspoon honey, juice from 1/2 a lemon, and 1 teaspoon of dijon mustard. Drizzle on salad when ready to indulge!